Dubbed the "next big thing in tech" by USA Today, 360 video is currently supported on such platforms as Facebook and YouTube. 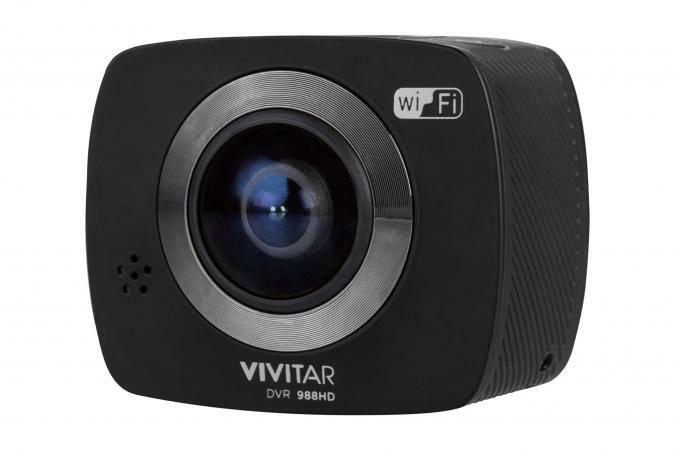 Aligning with growing interest in virtual reality (VR), shooting 360 video is more affordable and accessible than ever before thanks to devices like the Vivitar DVR 988HD. It's so much more than just an action camera. 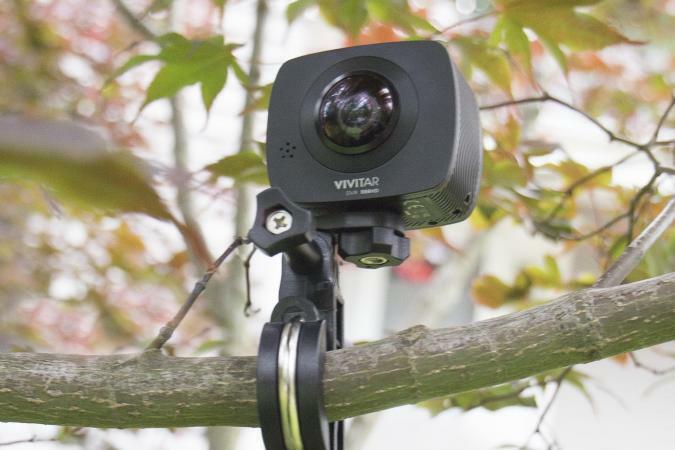 Measuring a little thicker than your typical GoPro, the Vivitar DVR 988HD is a 360 camera. This means it is capable of taking pictures and shooting videos all around it in 360 degrees. This is made possible by the pair of 12.1-megapixel lenses, one on the front and one on the back, each of which offers a 180-degree field of view. The two images are then automatically stitched together to create the all-around perspective. The main controls consist of three buttons on top of the device for power, Wi-Fi, and the shutter button. There is also a 2.0-inch screen for showing basic information like the time/date, battery level, and available storage. This is also how you navigate through the menu. There is a free mobile app available for iOS and Android devices, which you will want to download, but you cannot actually adjust any of the settings through the app. Due to the small screen and the lack of buttons, I found adjusting the settings on the camera itself to be slow and frustrating. 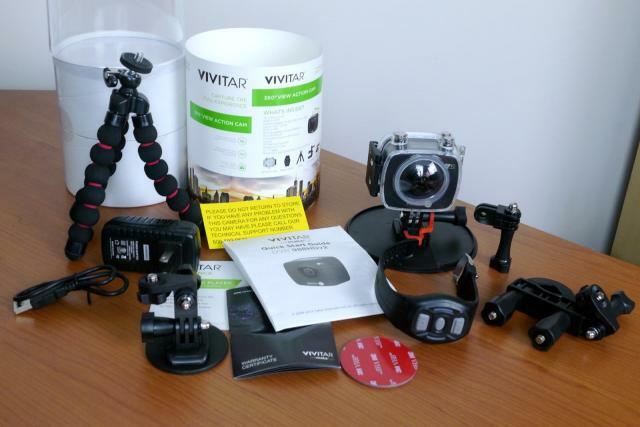 Unlike so many other products in this space, the Vivitar DVR 988HD comes bundled with quite the generous assortment of accessories. There's a protective waterproof case, a small tripod, a variety of mounts, and a remote control in the shape of a wristwatch, among other inclusions. The one crucial item missing from the package is a microSD memory card. Most cameras don't come with memory cards these days, so this is another expense you will need to factor into your buying decision. At its most basic level, this camera can be used like any other camera. Hold the power button to turn it and hit the shutter button to start recording a video. Press the shutter button again to stop recording. To switch between photo and video modes, press (don't hold) the power button. The problem is that because this is a 360 camera, if you take a photo by pressing the shutter button, your hand will be visible in the resulting picture. That's why you need to use the provided remote, which I found inconsistent, or the mobile app. Before you do this, though, you should go through the settings to adjust your preferences, like image resolution. Two big options notably absent from the available settings are the ability to mute the loud "beep" that sounds with every button press and the availability of a self-timer. The beep can get annoying and it detract from certain occasions or situations. Having a self-timer would overcome the issue of having your hand in the photo when you press the shutter button. 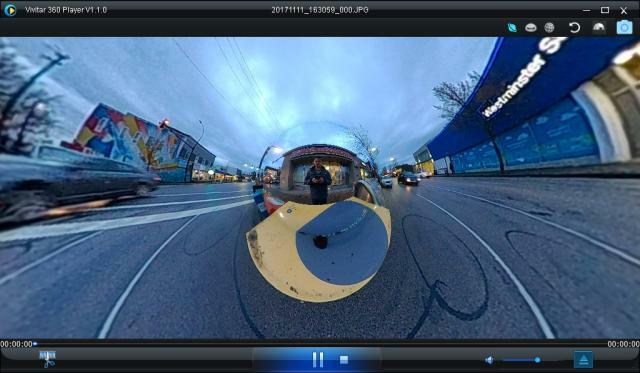 As 360 videos and 360 photos are not like their regular counterparts, you need specialized software in order to view and edit this content. In addition to the mobile app, Vivitar provides desktop software for both Windows and Mac computers. The software is relatively simple in its approach. After you download the photos and videos from the microSD card, either by taking it out and putting it in a card reader on your computer or by connecting the Vivitar action camera to your computer using the USB cable, you can open those files in the software. Once the file is open, you can hover your mouse near the top right corner of the screen to reveal three main viewing options. The "little planet" view shown here is especially interesting, whereas the "plane" view lets you navigate the image like how you would with Google Street View images and the fisheye view shows you a portion of the photo or video in a circular view. In all three cases, you can take your mouse to click-and-drag the image or video to adjust your viewpoint. You can also click on the camera icon (for photos) or the record button (for videos) to capture what you see on your screen within the software. This creates a flat photo or video that you can more easily share online. Uploading the 360 photos directly off the camera to Facebook seems to work as does uploading the 360 videos directly to YouTube. If you are expecting the same level of image quality that you would get using a normal camera taking normal pictures and videos, you're going to be disappointed. Nothing looks especially clear, and the image is very aggressively sharpened, even under ideal lighting conditions. Low light results in significant noise too. But we also have to recognize that this isn't like a normal camera at all. Even if it boasts 1080p and 4K resolution, those pixels are stretched out over a much wider field of view: the camera sees everything directly below and directly above you. It's the unique perspective that makes products like this so special, so you will need to temper your expectations accordingly. It would unfair to pit the Vivitar DVR 988HD against more serious pieces of photography and videography equipment. With a standard package that retails for around $150, it costs about half as much as a GoPro Hero5 Session but literally delivers more than twice the perspective. If you're looking for an amusing and affordable entry point into 360 photo and video, this action camera is a decent place to start. Disclosure: The author received a free sample of the action camera for purposes of this review. All opinions expressed are his own.